Coating & Lamination gives the printed product an extra special touch and creates a very high-quality effect. It is ideal to enhance print products like advertising materials. In this article you will learn about the difference between classic print coating which seals the colour and UV coating which is applied partially or completely and is particularly robust. Alongside common dispersion coating there are even more effective forms of coating, such as structure, relief or spot coating, which are usually manufactured with a UV coating. These coats are applied as an additional layer of coating with the aid of a special external coating machine and all achieve different effects. UV coating consists mainly of polymerisable binder ingredients and only dries with special UV drying systems. In this process the printed sheets which are to be coated are placed in the UV coating machine, the coating is applied extensively and dries thanks to the high-energy radiation which immediately takes the substances in the coating to another molecular level. A chemical reaction in the coating leads to a rapid change in the condition of the coating, it changes from a liquid to a solid. The result of this process is a print product with a glossy or matt surface which is characterised by its abrasion resistance and stability. The use of UV coating is particularly suitable for image brochures, flyers or folded leaflets due its high-quality look and feel. It also protects it against scratches and/or can be used outdoors. Partial UV coating is often associated with UV coating. Here the coating which protects against later fading is applied partially. It is usually applied in areas which are to be highlighted or have a visual impact. When printing a flyer, folder, image brochure or a similar product on photo paper, dispersion coating is often applied after the actual print process. This matt or gloss print coating, which is dried in a purely physical manner through the evaporation and absorption of the water, improves the characteristics of the material. The result is that the product becomes generally more glossy or matt. It is protected against abrasion and is provided with a slightly water-repellent surface. However, after this type of coating it is not possible to write on the product with normal pens such as ballpoint or fineliner pens. It is also extremely difficult to write on this paper with a pen after it has been printed on an inkjet or laser printer. Using cellophane / laminate – is a great way of enhancing a product. This process involves wafer-thin film as opposed to varnish. It is also known as film lamination. It can be produced in glossy or matt variations on one or both sides. Wet or thermo lamination is used for the application of the film. In the first instance it is stretched over the paper with transparent glue under pressure and heat. The solvent evaporates through the heat. The coating of the paper via thermo lamination takes place with special thermo-active glue. In this process the warmth binds both materials through the effects of melting and pressure. The matt cellophane gives the print product a soft, agreeable character with a pleasant, velvety feel. Due to the low light reflection a non-glare surface is created and the images look harmonious, simple and elegant. Glossy lamination, on the other hand, increases the colour effect to a great extent as it gives the colours more strength and depth. Therefore a special colour intensity is achieved. Advantages of a laminate print product include protection against scratches and abrasion as well as a robust surface. It is water-repellent and therefore offers protection against dirt. The print product is easy to clean via a gentle wipe (using some moisture). 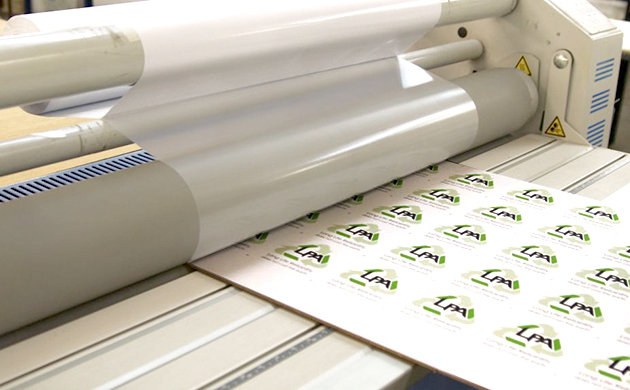 Film lamination generally enables flyers, cards and brochures to achieve a longer life as they are made more durable through the film lamination.